With its vast library of third-party add-ons, its cloud saving capabilities, and its fluid and diverse range of applications, it’s easy to see why Microsoft Word is one of the most popular word processing programs in the world. Although its popularity stemmed from its easy-to-use navigation and graphical user interface, it has remained dominant in the word processing software space because it increases worker productivity and it is incredibly easy to design for. Due to the fact that millions of individuals use the software on a daily basis, being able to convert Word into a mobile application is something that many businesses could benefit from. In this article, we will take a look at the negatives associated with using Microsoft Word for business and why you should convert your Word forms into mobile applications instead. Although Microsoft Word is currently the number one word processing software available in the marketplace, this doesn’t mean that it is necessarily the best and only choice to consider when using Word forms. As the later versions of Microsoft Office came out, from 2007 onward, users of the older versions of Microsoft Word were unable to open or edit any documents that they received in the later version of the software. This is because the default file extension changed from .doc to .docx and so an extra step was necessary to save the files in a compatible format. This also means that users who use the newer versions of the software are likely to encounter formatting problems when opening documents from individuals who use an older version. Unlike software options like WordPerfect, Microsoft Word has no reveal codes, meaning that you cannot access the exact coding for each character within the document. So when an individual experiences problematic formatting, one cannot just simply look at the coding to find the problem. In most cases, you either have to fiddle with the formatting or use a different format which can be costly both in time and productivity. Although most individuals do not use Microsoft Word has a web publisher, it does have the capability. Unfortunately, due to Word’s bloated code and limited visibility, a lot of image files with Microsoft Word do not show up correctly on the web. Microsoft Word is prone to virus and malware attacks due to the simple fact that is popular and is installed on millions of computers. Microsoft Word comes with a lot of meta information that gets saved alongside every file. This is not great for individuals who are saving a lot of files as these files can grow to an unmanageable size. This means that one will need more media storage just to hold these files. In order to avoid these negatives, many businesses are choosing to convert from Word forms to mobile applications instead, which offer greater flexibility and more security than a regular Word document. Here are a few reasons why you should consider turning word forms or documents into mobile applications. You can set password secure logins with a mobile application. You can create a Word document with data that is collected through your mobile application and e-mail that document as an e-mail attachment to your contacts. You are able to assign permissions and rights to your Word documents through user privileges when it is converted to a mobile application and still work simultaneously. 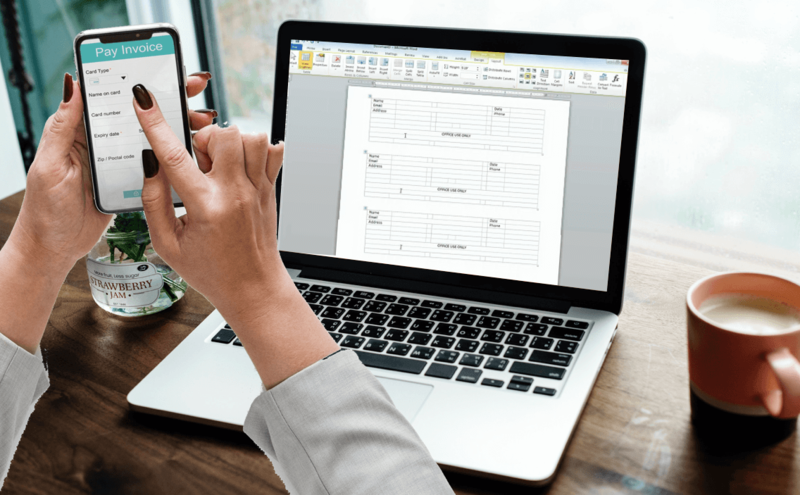 By converting your Word forms into a mobile application, you can have all of your forms right on your phone which negates the need to carry a laptop. Data that you would store within your application can be stored locally to the mobile device it is on and thus the user does not need an Internet connection to collect and use the data in their forms. The data that is stored on the mobile application can be synced to a central server and viewed by multiple people without needing to send multiple documents to everyone. What Type of Industries Can Benefit From Converted Word Forms? Regardless of whether you have a small or large business, any company that uses general use Word forms will benefit greatly from converting them into mobile applications. General Word forms can include templates like employment applications, resumes, brochures and greeting cards or any form that contains an address, name, city, and level of education. Beyond general Word forms, any business that does any type of event management, marriage or wedding ceremonies, gathers field investigation data, or uses data entry in the educational field, can use mobile applications as a way to register data through automation and eliminate the need for manual data entry. So Why Choose Lets Nurture For Your App Development? Get in touch with us today to find out what other benefits you can reap by converting your Word forms into a mobile application for your business.